New media channels allow for a proliferation of unlimited online comments which are not always factual, however also represent a significant democratic extension of people participation, PLP MP Walton Brown said. Mr Brown was speaking at a presentation about the challenges and opportunities for Members of Parliament with the ‘new media’ at a recent seminar in Singapore. 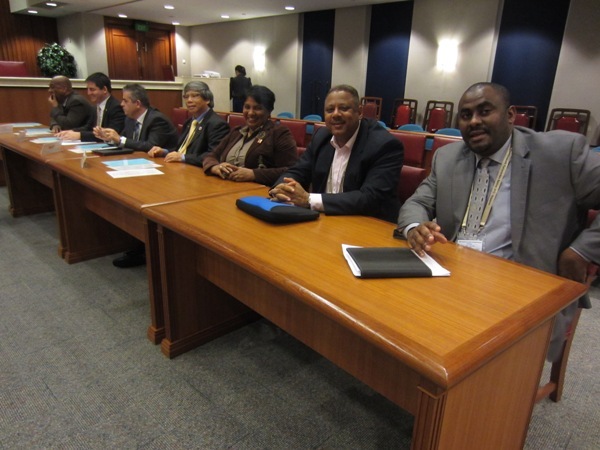 The 24th Commonwealth Parliamentary Seminar was held at the Singapore Parliament House from 27 May to 1 June 2013. According to a report [PDF] Mr Brown identified the five challenges and five opportunities presented by new media. Proliferation of unlimited enormous comments online, news media, on talk radio, on Twitter. The facts were not all factual. The manipulation component was readily present. For parliamentarians who refused to embrace it, they would find themselves increasingly marginalised in terms of political discourse. All politicians who were challenged by the technology, resistant to new technology would findthat there would be a wider and wider gap between their political concerns, ambitions and activity and the concerns and interests of a younger generation. Seemingly became a substitute for social activism. It represented a significant and important democratic extension of people participation. It allowed for information to be shared much more readily. It shifted the power base of mainstream media. It allowed for politicians to have a wide-range of modalities of contact and information and information exchange with their constituents. It allowed MPs, aspiring politicians to be able to present themselves in far more than a one dimensional manner that the media traditionally presented parliamentarians. Speaking about Mr Brown’s presentation, the report said: “The presenter concluded that the new social media had fundamentally transformed the information dissemination process. Quite a few local politicians are on Facebook, however Mr Brown is one of the few Parliamentarians who is active on both Twitter and Facebook, as is Deputy Premier Michael Dunkley. During last year’s election, both political parties — and some Independent candidates — made use of new media channels, frequently posting YouTube videos and maintaining Twitter feeds and Facebook pages. You can read the full report on ‘MPs & the New Media’ presentation here [PDF]. What, no comments? I guess nobody else could make much sense of what he had to say either. Walton & Paula would make a good pair, saying much without saying much of anything. Mr. Brown omitted one major factor in the rise of the new media(s): very low entry costs, in fact basically free after hardware costs…But then, the gentleman has never been one to pay much attention to costs. New research published in the UK yesterday stated that the mainstream media (newspapers and broadcasts) still break news stories quicker than Twitter (Facebook was not included in the research). However, Twitter was much better at gathering eye-witness accounts and personal experience stories. I think that social media fundamentally shifted the political results of Bermuda’s last general election, as it better defined the issues that became very critical in the general election. The newspapers may have initially published the stories, but bloggers placed the spotlight on issues that became politically important, not the politicians and/or news media. Social media can dispel inaccurate stories, articles and/or rumours immediately, as well as place falsehoods in the public domain much faster than any newspaper’s retraction and/or apology. Traditional media lags behind in the supervising and/or controlling of the content of the story on their blog. Hence, the story can take on a different focus and change from informative to investigate by the level of interest, new information shared and the perception of the story by the bloggers. Whether newspaper blogs will give way to Twitter accounts as the ultimate way of getting and/or receiving immediate, relevant exchanges still remain to be seen. But, for politics in Bermuda it will play a vital role in the next general election as Bermudian bloggers are very focused on and hungry for political news.